The CASE Standard and Functional Evaluation (SAFE) Checklist aims to guide consumers and car dealers through an in-depth inspection and professional evaluation of the pre-owned car before the sale is made. This provides a clearer picture of the condition of the car versus the selling price so that consumers can make a more informed purchase decision. The Checklist allows for documentation of the condition of the pre-owned car at the time of purchase in the presence of the car dealer and consumer. It also encourages dealers to send the car for inspection at a Professional Evaluation Centre and helps consumers better understand the results of the Professional Evaluation Report provided by the Centre. Download the full version of the SAFE Checklist here. Download the brochure on the SAFE Checklist here. Prepayment refers to money paid in advance to a business before completion of the service or delivery of the goods. The collection of prepayment is popular in many industries, notably in the purchase of beauty or travel packages, fitness club memberships, home renovation services, as well as big-ticket items such as cars, furniture, electrical and electronic goods. However, consumers risk losing their prepayments should the business suddenly close down without fulfilling their obligations. How can you protect yourselves against loss of prepayment? 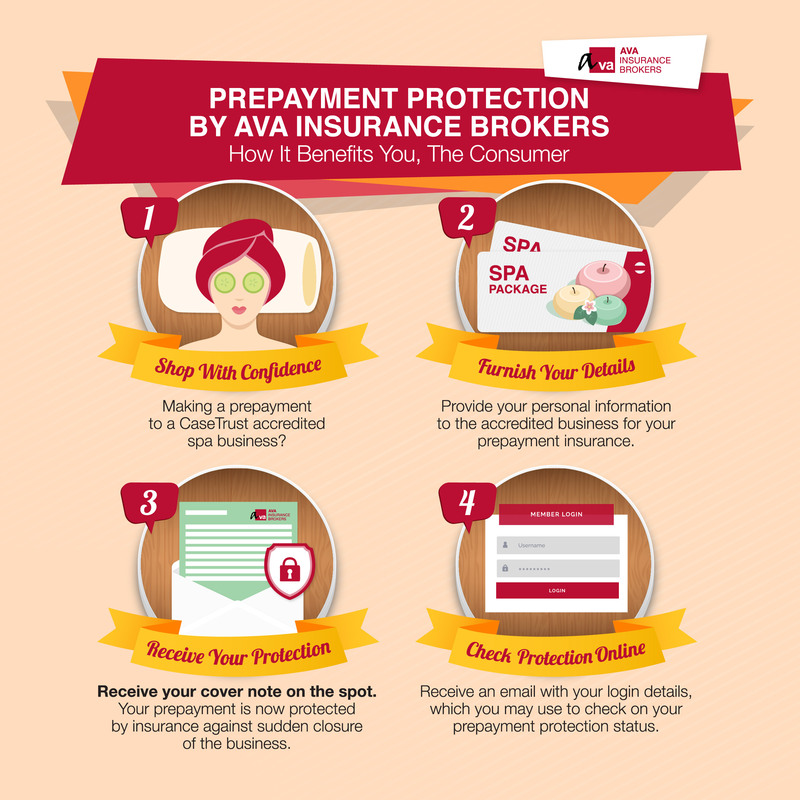 CASE offers five tips to safeguard your prepayments below. Avoid buying pre-paid packages that involve large sums or lengthy contract periods. Ask about the refund policy for your prepayment before agreeing to the deal. For more details on the above five tips, please download the infographic here. Also, check out the Ministry of Trade and Industry’s Infographic - Pre-Paid Package Deals: What You Should Know. A chargeback is an existing form of consumer protection which allows credit card users to dispute a charge and reverse the transaction should a purchase goes awry. Generally, consumers can ask for a chargeback within 120 days of the date of transaction if they encounter non-delivery of goods and services, delivery of defective/unfit goods and services, credit card transaction errors and/or unauthorised transactions. Download CASE’s chargeback guide for consumers here. More details can be found on The Association of Banks in Singapore’s FAQs on credit card chargeback & dispute resolution here. Afraid of losing your advanced payment to a Spa business during sudden business closures? 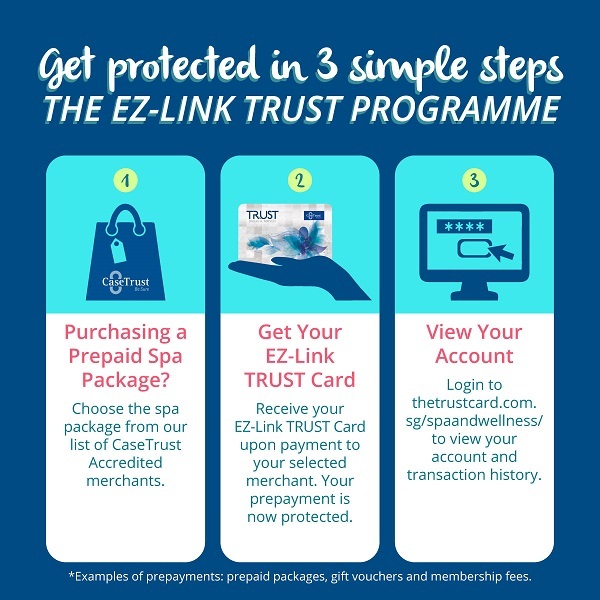 Get yourself protected with the EZ-Link TRUST (Prepaid Cards) Programme or AVA’s Spa, Beauty & Wellness Insurance which lets you shop with a peace of mind at participating CaseTrust Accredited outlets! Most Singapore retailers have fair business practices, but there are a small number of retailers that might make your shopping experience less than ideal. Here are some smart shopping tips to ensure that your retail experience is a pleasant one. For the Mandarin version, please click here. Certain types of air-conditioners are classified as Controlled Goods under the Consumer Protection (Safety Requirements) Registration Scheme, and are required to carry the SAFETY Mark. Consumers can verify if the air-conditioner is a Controlled Goods and if it is registered by checking the Safety Authority (Enterprise Singapore) website. Take note of equipment warranty. Consider warranty terms and conditions when considering between various brands. Put down verbal agreements in writing. Ensure that all communications with the vendor are written and not merely a verbal consent. Be informed of methods of dispute resolutions. Consumer with unresolved disputes can approach CASE for assistance or file their claim at the Small Claims Tribunals. Consider taking up travel insurance. It is prudent to take up travel insurance to protect oneself from risks, for example, cancellation of tours due to unforeseen circumstances such as flooding, SARS, etc. Get tips on travelling. The National Association of Travel Agents Singapore (NATAS) has a website (http://www.natastravel.com/traveltips.aspx) that provides useful information on what to look out for when considering a travel package. Members of NATAS are also committed to adhere to a standard refund policy. Know the methods of dispute resolutions. Should a consumer have a dispute with an airline and is unable to resolve it, the consumer can seek CASE assistance or file a claim at the Small Claims Tribunals. Beware of hype. Get a second opinion if in doubt. Consumers should also familiarise themselves with the financial products offered on the market to get the best deal for themselves. Elderly consumers should be aware that this is a business transaction and should not sign up just because the teller is nice and helpful. Read the terms and conditions of your agreement carefully. Although the terms and conditions are mostly in fine print, consumers should still go through them carefully. If you do not understand, do not sign up on the spot. Ask questions to clarify all doubts. Never focus solely on expected profits. Consumers should also pay close attention to possible risks and losses. Be informed of methods of dispute resolutions. Most banks have a Quality Service manager, whom you should contact first in event of a dispute. If the dispute remains unresolved, consumers can approach the Financial Industry Disputes Resolution Centre Ltd (FIDReC) for assistance to resolve their financial disputes. It is an independent and impartial institution specialising in the resolution of disputes between financial institutions and consumers. Contact CASE for assistance. Consumer requiring assistance can also call the CASE hotline for advice. Check terms and conditions. Many contracts drafted by beauty salons state that "all payment made is not refundable" or disclaimers such as "The salon is not responsible for any failure of the treatment". Consumers need to consider these unfavourable terms before accepting any offer made. Verbal promises made should be put in writing. Check prices before accepting. Ensure that prices are correct before signing on the credit card slip or keying in the NETS PIN. Monitor credit card statements. It is a good practice to monitor one’s credit card statements for transactions made, especially after a disputed credit card purchase. There is no such thing as a free lunch in this world. Free gifts are generally tactics used by marketers to attract consumers. Offers of free gifts should be treated with extra caution. Take your time to consider. Even if consumers are keen on the package, they should take a few days to think over the offer. Purchases made on a moment of impulse might not be financially viable in the long run. Many consumers have regretted signing up for costly packages on the spot. Know your rights. Consumers should not be pressurised into signing a contract. Request for time to consider whether to enter into a contract. Simply leave if you feel pressured to sign up. Exerting undue pressure on a consumer to enter into a transaction is an unfair practice under the Consumer Protection (Fair Trading) Act. Consider calling the Police if you are not allowed to leave the premises. Know the limitations of current beauty technology. The Singapore Code of Advertising Practice (SCAP) has a section that states; every advertisement of a product, service or other activity which purports to alter the shape or appearance of the breasts or the bustline shall contain the following disclaimer: “There is no scientific proof that any non-surgical treatment currently available can enlarge breasts. Seek Medical consultation. Before committing to any beauty treatment, it is advisable to seek the opinion of a medical doctor. Some of the conditions can be treated by a medical professional. . The National Skin Centre and some medical clinics offer professional help for skin problems. Health should be the priority. When considering a new beauty, skin, or slimming treatment, inform the beauty salon of any existing health conditions, e.g. allergies, illness, pregnancy, etc. If in doubt, it is always good to get a second opinion with a doctor. Consumers should do thorough research on the bridal agency before deciding to engage the business. Some areas to look into include past reviews by previous customers on the services rendered by the agency or scrutinising the agency’s track record and reputation. Consumers should also read the terms and conditions of the contract carefully to ensure that there is a refund policy put in place in the event that the agency fails to deliver what they had promised. Consumers can protect their prepayment by negotiating to pay a small deposit instead of the full amount upfront to the bridal agency. Consumers can also purchase wedding insurance for additional assurance or protection. Know your redress options. Consumers can consider approaching CASE or the Small Claims Tribunals if they cannot resolve the dispute personally. Consumers should pay attention to instruction labels on the clothes. If there are none, it is advisable for consumers to ask the retailer if the item needs special treatment, such as dry cleaning. Take note of Terms and Conditions. Consumers should take note of the terms and conditions of the transaction, and find out the relevant refund or exchange policy. Check item before leaving. Consumers should check their purchased items thoroughly before leaving the shop and give feedback on any problems promptly. Be informed of methods of dispute resolutions. Consumers can approach CASE for assistance or lodge a claim at the Small Claims Tribunals if they are unable to resolve their dispute with the retailer. Put down verbal promises in writing. Consumers should request that verbal promises are put down in writing. If the company refuses, then consumers should consider choosing other options. Take your time. Go through the terms and conditions carefully before committing yourself to any membership package. Consumers should also consider if they would be able to utilise the package effectively. Ask about options for refund. Consumers should enquire if a refund will be allowed for unused portions of services. If so, consumers should insist that the company put this in writing. Take note of any standard procedures or requirements for termination. Termination. If the club agrees to the termination, consumers should request for a letter of termination from the vendor for safekeeping. Know your rights. Consumers have the right to seek redress under the Consumer Protection (Fair Trading) Act if misleading or false claims are made by companies. CASE options for complaints. Consumers can lodge a complaint online at www.case.org.sg, or visit the CASE office at the Ulu Pandan Community Centre. Terms and conditions. Consumers should pay attention to the terms and conditions of purchase, and ascertain the vendor’s exchange policy if it’s not stated clearly. Put verbal agreements in writing. Ensure that all communications with the vendor are written and not merely a verbal consent. Ensure that the software is not pirated. Pirated software will put the consumers in unnecessary risk. Warranty. Ensure that you purchase a computer that comes with a warranty whether it is one year warranty or extended warranty. Be informed of methods of dispute resolutions. Consumers can lodge a claim with CASE or the Small Claims Tribunals if they are unable to resolve their disputes with the retailer. Consider an accredited contractor from CaseTrust. Consumers are encouraged to engage an accredited contractor from CaseTrust. While this does not guarantee zero problems, consumers are assured of the availability of dispute resolution measures. Request for quotations. Consumers are advised to obtain different quotations before committing to a service package so that they will be less vulnerable against misrepresentation, overcharging and pressure sales tactics. Verify claims made. If a person purports to be from a government agency, call the agency in-question to verify. Most agencies will put up circulars or inform the public through the media when retrofitting works are required. Consider using a model agreement. Consumers can use the Model Agreement on Home Renovation provided by CASE. Click here to view PDF. Read before you sign. Any document that needs a signature should be read through carefully [both front and back pages] before putting down one’s signature. Clear contract. The contract agreement should reflect clear itemized billing and listing of products and services. Work out a schedule with the contractor. Ensure clear deadlines for completion and rectification works. Payment for services should be rendered progressively. Do not make full payment upfront. Document outstanding defects. Consumers can take photos of outstanding defects, and compile a defects list after completion, so that they can be resolved systematically. Seek advice. If consumers are in doubt, they can call CASE hotline at 6100 0315. Understand the education environment. The Ministry of Education (MOE) registers private schools, the courses they offer and the teachers conducting the registered courses. However, registration by MOE does not in any way represent an endorsement or accreditation of the quality of the schools, courses and teachers offered. Do research on courses of your choice. Before signing up for any course, do thorough research on the school conducting the course. Consider the reputation of the school, size of the class, credentials of the teaching staff and the course materials provided. Understand the Terms and Conditions. Always read the terms and conditions of the agreement. Consumers are encouraged to opt for schools with clear polices concerning refund and termination of courses. Consumers should also find out the options available to them if the school is unable to complete the course according to the scheduled timeline. Look out for Private Education Institutions (PEIs) registered by the Council for Private Education (CPE). The Council was set up in December 2009 to regulate the private education sector in Singapore. Consumers can find out if the PEI is registered by the CPE at the CPE website which can be accessed at www.cpe.gov.sg. Verify claims made before buying. Claims made by retail shops (e.g. warranty will be sent to you later) should be verified with the main dealer or distributor. The Lemon Law protects consumers against defective goods that fail to conform to contract or are of unsatisfactory quality or performance standards at the time of delivery. Keep all proof of transactions in case of defective products. Terms and conditions. Always read the terms and conditions of your sales agreement carefully, paying attention to warranty period and refund conditions. Local set or "grey" set. Parallel-imported (also known as grey market) products are normally not supported by the local distributor, i.e. there is no warranty for such products. Do some market research before a purchase. Consumers can consult local web forums to get feedback on electronic products, and other issues like after-sales service, prices, defects etc. Compare prices. Some camera shops provide quotations via email, allowing consumers to easily compare prices before making a purchase. There are also electronic fairs that occur every 3 months which allow consumers to easily compare offers from competing brands at one location. Be aware of warranty requirements. Most companies require a proof of purchase (e.g. receipt) in addition to the warranty card when sending in a product for repair. Also, do note that most warranties are valid locally only. Look out for the SAFETY Mark - 33 categories of household electrical, electronic and gas appliances and accessories are classified as Controlled Goods under the Consumer Protection (Safety Requirements) Registration Scheme. They are required to be type-tested, to ensure that they meet the relevant safety requirements, registered with Enterprise Singapore and affixed with the SAFETY Mark. Consumers can verify if the product is a Controlled Goods and if it is registered by checking the Safety Authority (Enterprise Singapore) website. Confirm payment arrangements before agreeing. Request for a written quotation if the work to be done is known. If a site inspection is required to ascertain the extent of work, confirm the transportation charges first. Consumers can consider asking for a few quotations to compare prices if the work is not urgent. Insist on a receipt for payment made. At the very least, consumers should ask for a signed acknowledgement of payment made, so that there is proof of payment. Insist on an approved circuit breaker. Circuit breakers are designated as controlled goods under the Consumer Protection (Safety Requirements) Registration Scheme and must have the "SAFETY Mark". Consumers can verify if the circuit breaker is registered by checking the Safety Authority (SPRING Singapore) website. Check the purchase. Consumers should not leave the amount of food provided to the sole discretion of the caterer. They should confirm the amount of food ordered and also find out if an additional buffer amount will be provided in case what is provided is insufficient. Confirm the purchase. Ensure that the menu and the amount payable are confirmed before agreeing to sign the contract. No verbal commitment. All relevant details pertaining to the transaction should also be committed in writing. Ensure proof of authorization documents available. Consumers should make sure that the food caterer is licensed. Be informed of methods of dispute resolutions. Consumers can also lodge a claim with CASE or file a claim at the Small Claims Tribunals if the caterer engages in unfair practices as defined in the Consumer Protection (Fair Trading) Act. Get what you paid for - When purchasing weighed food items, look for the ACCURACY Label on the weighing or measuring instrument to ensure that the instrument has been verified as being fit for trade use. For more consumer tips on Weights and Measures, refer to the Enterprise Singapore website. Compare prices before, and not after a purchase. Consumers should compare between furniture products of several companies before purchasing. They should also ask about possible additional costs, for example, delivery charges. Put down the delivery date in writing. If a company is not comfortable with setting a date, then the consumer should factor in potential delays, or choose another vendor. Ask about warranty. Take into account the warranty, terms and conditions when considering between various offers. Ensure no hidden cost. Consumers should also find out if there are any additional costs not factored into the purchase price, such as delivery charges. Resolve the dispute progressively. The general rule for a defective product is that consumers can ask for a repair, and if not, a reduction in price or refund. Consumers can approach CASE or the Small Claims Tribunals if they are not able to resolve the dispute on their own. Know your rights. Consumers have the right to seek redress under the Consumer Protection (Fair Trading) Act if they are misrepresented. Do not feel shy to say 'No' to pressure selling tactics. Consumers can simply walk away if not interested or do not feel comfortable to make the purchase. If they are detained against their will, consumers can approach the police for assistance. Get a second opinion. Consumers can consider getting a second opinion of their existing hair condition with a doctor. Check for warranty. Check that a warranty card is provided at the point of purchase. As export sets are usually not covered under local warranty, they cannot be repaired at local authorized service centres. Read the Terms and Conditions on the warranty card. Check that the mobile phone and accompanying accessories are in working order at the point of purchase. The Lemon Law protects consumers against defective goods that fail to conform to contract or are of unsatisfactory quality or performance standards at the time of delivery. Keep all proof of transactions in case of defective products. If there are problems with the handset, consumers are advised to approach the authorised service centres for repair. Resolve the issue progressively. Most companies will first offer to repair the defective mobile phone. Consumer should note down and keep receipts of repeated repairs. They can request for a replacement if the mobile phone remains defective after several repairs within the warranty period. Know your rights. A consumer has the right to contest any adverse assessment of claims. He/she has the right to request for the assessment to be given in writing particularly so when the insurer imposes any exclusion or reduction on the claim made. Get professional help. If consumer is doubtful that the insurer’s assessment is fair, he should seek the help of a qualified financial adviser to give a professional view on the matter. Put it down in writing. When specifying a pre-existing condition, a consumer should make sure that it is put down in writing, and not just acknowledged verbally. Read up on the subject. The Monetary Authority of Singapore (MAS) has a consumer education website (www.moneysense.gov.sg) that features useful educational information. Most insurance policies come with a 14-day "free look" period for consumers to review the agreement. Investment linked policies require more careful research by consumers. Consumers should note that investment returns are generally not guaranteed as it fluctuates with the performance of the fund linked to the policy. Consumers should also find out more about the various aspects of the insurance products (benefits and risks, payment of premiums, insurance coverage, whether switching of funds is possible) to ensure that the product is appropriate for their needs. Other alternatives. Besides CASE, consumers can also approach the Financial Industry Disputes Resolution Centre (FIDReC) for Mediation and Adjudication of the dispute. Terms and conditions. Read the terms and conditions of your agreement carefully. It would be prudent for consumers to get vendors to commit in writing that there will be no hidden costs involved. Work out a schedule with the designer. Ensure clear deadlines for plans and submission to the relevant authorities for approval if necessary. Know the methods of dispute resolutions. Consumers with unresolved disputes can seek CASE’s assistance or file a claim at the Small Claims Tribunals. Terms and conditions. Consumers should take note of the small print on their sales invoice specifying the terms and conditions of the transaction. Consumers should pay special attention to the clauses concerning damaged items. Some laundries may limit their liability for clothes up to a number of times of the service charge. Consumer should insist that the liability should be based on the value of the laundry that has been damaged. Be cautious. Consumers should check their items thoroughly at the point of deposit of the clothes and collection and feedback any problems promptly. Pay attention to the instruction labels on your apparel and highlight them to the vendor. If necessary, you can also commit in writing instructions to process any specific garment on your sales invoice. Know the methods of resolving a dispute. Consumers can lodge a claim with Case or the Small Claims Tribunals if the consumer is unable to resolve the dispute with the retailer. Check that a maid agency is licensed. The Ministry of Manpower (MOM) keeps a list of licensed employment agencies (EA) online. (http://www.mom.gov.sg/foreign-manpower/employment-agencies/employment-agency-directory/Pages/employment-agency-directory.aspx). MOM has also introduced a demerit points system. Demerit points are issued to EAs when the EA infringes the EA Act, Rules or Licensing Conditions. The list of Employment agencies with demerit points can be found on the same website. Check terms & conditions before signing. Currently, there is no standardised maid agreement. Therefore, consumers should read the contract carefully to avoid agreeing to one-sided terms and conditions. Commit in writing. Before signing the employment contract, read the terms and conditions carefully. Verbal agreements not found in the standard contract should be committed in writing. Clarify all hidden costs. Consumers should find out if there are any additional fees payable. It is also advisable for consumers to get agencies to commit in writing that there will be no hidden costs. Terms and conditions. Read the terms and conditions carefully before committing to any service package. Find out if any refund policy is applicable. Consumers should formalize any refund arrangement that they have negotiated with the agency in writing. Think twice before making a decision. As matchmaking is to introduce a life partner, do not be hurried into making a decision. The foreign bride IS NOT merchandise that can be returned. Know the immigration procedures. If the consumer is meeting the foreign bride overseas, please do the necessary research before going. Ensure proper documentations are done, inclusive of application for residency of foreign brides. For specialized devices meant for long-term use, consumers should opt for products with clear and acceptable refund and exchange policy. These products should also come with a warranty in event of the need for repairs and maintenance. Get a second opinion. Consumers are advised to consult a professional who can work with you to decide which medical device/medication is most appropriate for your needs if the current doctor’s explanation is not sufficient. Do not sign anything with medical terms that you don’t understand. Ask about a trial period. With a trial period, you can try out the product to ascertain if the medical device is right for you. If there are applicable costs, have it committed in writing. Be aware of exaggerations. Consumers should be wary of exaggerated or misleading claims on medical device/medication that state otherwise. Know the methods of dispute resolutions. Consumers with unresolved disputes can approach CASE for assistance or file their claim with the Small Claims Tribunals. Consumers who plan to purchase a secondhand car should consider using CASE’s Standard and Functional Evaluation (SAFE) Checklist which helps to guide them through an in-depth inspection and professional evaluation of the pre-owned car before the sale is made. Put down important terms in writing. Claims made should be put in writing to prevent potential disputes, as it is not easy to enforce verbal agreements. In this instance, wild claims like "loan will be definitely approved" would be weeded out. Know the procedures, laws and policies involved in a car purchase. First, a Certificate of Entitlement (COE) has to be obtained; next a hire purchase loan has to be obtained. The Land Transport Authority (LTA) website (www.onemotoring.com.sg) provides information on procedures and policies, for example, how to bid for a COE. Hire-purchase loans taken after 1st November 2004 would be subject to the amended Hire-Purchase Act. The Ministry of Trade and Industry has a frequently asked questions (FAQs) webpage on the changes (http://www.mti.gov.sg/). The Motor Traders Association also has a consumer guide on the procedures in purchasing a car (http://www.mta.org.sg/). Find out more about hire-purchase transactions. Consumers should find out more about details of the hire-purchase arrangements, e.g. computation of interest payable/monthly instalment, and early settlement. Do your sums before you sign. The LTA website mentioned above also provides a detailed breakdown of car costs, which enable consumers to calculate the profit mark-up of car dealers. Do not sign blank forms. Signing of blank forms is akin to signing a blank cheque and it could result in fraudulent entries without you knowing it. Deposit. Ensure that the contract states in writing that the deposit will be refunded if the loan is not approved. Consider mediation at CASE. Mediation is voluntary, the final decision is made by both parties (and not the mediator), and settlement arrangements are kept private and confidential. With effect from 15 April 2009, motor vehicle dealers must inform the consumer in writing of his refund policy before receiving a deposit from the consumer. Also with effect from 15 April 2009, consumer can request for a written statement (by the financial institution) from the motor vehicle dealer on the rejection of the loan application. Consider motorcare companies accredited by CaseTrust. The CaseTrust accredited companies can be found on CaseTrust's website (www.casetrust.org.sg). Read the sales agreement carefully. Are all relevant costs included in the pricing? Though the consumer guide provided by the Motor Traders Association (http://www.mta.org.sg) relates to motorcar purchases, consumers can also refer to the guide for the items to look out for with regards to motorcycle purchases. Know the law. The Land Transport Authority (LTA) website (www.onemotoring.com.sg) provides information on procedures and policies concerning purchase and sales of motor vehicles. Put all verbal promises in writing. As it is not easy to enforce verbal agreements, it is more prudent to commit it in writing. Consumer should also request the vendors to provide a breakdown of the pricing. Please ensure that they write it in pen and NOT PENCIL as pencil writing can be erased. Do not sign blank agreements. Be sure that the pricing and items promised are clearly stated. Check out loan plan. Consumers should also check out loan plans for motor vehicles from the relevant financial institutions rather than depend solely on the vendors for advice. Do read up on Hire-purchase. Warranty for the motorcycle. If you are purchasing a new motorcycle, ask for the warranty. The Lemon Law protects consumers against defective goods that fail to conform to contract or are of unsatisfactory quality or performance standards at the time of delivery. Keep all proof of transactions in case of defective products. For second-hand motorcycles, there will also be limited warranty available. Due to previous usage, there could be some wear and tear. If possible, go with someone with experience in buying second-hand motorcycles. Question the vendor on the history of the motorcycle. Send the motorcycle for inspection immediately if you suspect something faulty after the purchase. Research on the motorcycle. Find out more about the type of motorcycle you are interested in and its typical problems that you might encounter. Some problems may not lie with the dealer, but rather, is due to the vehicle itself. Consumers should do their own research on the company and ask around for references. Check the company’s reputation and background by reading reviews and ratings by their past customers. Ensure that the company is insured. Ask about the type and extent of insurance coverage. Does it cover for delays, damaged and loss of items? Bear in mind that there will most likely be a cap to the amount that consumers can claim. Enquire about the cost. Companies often provide different pricing structures depending on the type of deliveries demanded, the weight and size of the items to be transported, and the distance from the point of origin to the destination. If a quote is much lower than the others, it could be an indicator of sub-standard service or higher fees that may be added to your bill later. For long distance or overseas deliveries, the company will usually drop by to inspect your items in order to prepare an accurate quote for their service. Consumers should be wary if the company fails to do the inspection or mentions that it is unnecessary. Ensure that the quote contains an accurate and comprehensive list of the number of boxes to be moved, the size and value of items, the cost per hour or flat rate and terms of payment, and timing of services to be provided. Do not sign a contract unless these options are spelled out in writing. If items are being moved out of the country, be sure to obtain the contact details of the agent who will be receiving the items at the overseas destination. Ask whether the company offers order and delivery tracking services. This allows consumers to track their package and be kept informed about the transit of the package in real-time. If the company does not offer such a tracking tool, consumers should request that they contact them once the package has been delivered and follow up with the recipient of the package to confirm. Consumers should not be shy to say ‘No'. Stand firm against pressure sales tactics. Decline offer of sales person to visit your home. Be aware of the 3 days cooling-off period. If the products are sold door to door, the consumer has 3 days to cancel the contract. However, in light of the new amendments passed, contracts signed after 15 April 2009 will be entitled to a 5-day cooling-off period instead. Known as the cooling-off period, it starts the day after the purchase is made, discounting Saturdays, Sundays, and public holidays; or if the cooling-off period was not brought to your attention before or at the time you entered the contract, the day on which it was subsequently brought to your notice. Cancellation of the contract should be done in writing. Consumers can deliver it personally to the vendor, or send it by pre-paid post or fax. Consumers with disputes against member companies of the Direct Sales Association of Singapore (DSAS) can approach DSAS for assistance to resolve the dispute. Consumers with unresolved disputes can approach CASE for assistance or file a claim at the Small Claims Tribunals. Shop at trusted and secure websites to ensure that online transactions are safe. It is important to look out for the "https" and the "lock" icon in the URL to ensure that the website is secure. Always use mobile data network or connect to a password-protected Wi-Fi network when making online purchases. Do research before each purchase to have the full information of the prices and extra charges (e.g. postage fees), terms and conditions, exchange and refund policy of the product. Consumers should always remember to check their bookings or shopping cart to ensure that prices are correct before making final payment. Do research on unknown merchants retailing items online. Consumers should ascertain the identity of the merchant and ensure that there is a valid physical address on the website. They can also read online reviews and ratings given by other consumers on other third-party websites. These may provide a good overview of the reliability of the merchant in terms of delivery speed, product quality and after-sales service standards. Always get contact details of the merchant. Get all the queries answered before committing to any purchase and save a copy of all the communication with the merchant in case it is needed in future. Exercise caution with international transactions, as well as for high-priced and popular items. For household electrical and electronic goods, check that the product is suitable for use in Singapore and meets relevant safety requirements e.g. it comes with the appropriate mains plug and power supply voltage. Look out for the SAFETY Mark if the product falls under one of the 33 categories of household products covered under the Consumer Protection (Safety Requirements) Registration Scheme. Examples of such products include hair dryers, kettles and standing fans. Get the necessary advice with regards to your eye problems from professionals like optometrists, opticians and ophthalmologists. Request proof to substantiate claims. Consumers have the right to insist that the professionals who he/she consulted about his eye problems substantiates any claims made by them. Put verbal promises in writing. Consumers should always take note to commit in writing the type of lens purchased and the claims made. This will help ensure that they have written proof of what they have been promised by the vendor. SOTA. Consumers who have a dispute with a retailer of optical products and services can check if it is a member of the Singapore Optical Traders Association (SOTA). SOTA has signed a Memorandum of Understanding (MOU) with CASE to encourage their members to participate in CASE’s mediation services to resolve dispute with consumers amicably. Know the methods of dispute resolutions. Consumers can also lodge a claim with CASE or the Small Claims Tribunals. Terms and conditions. Consumers should check that clear records have been made with regards to any claims for cash refunds or refunds in kind. Consumers should also request for receipt or proof of transactions. Verbal agreements should be committed in writing. Research on the pet. Consumers should also find out more about the pets that they are planning to purchase to avoid being overcharged. The Lemon Law protects consumers against defective goods that fail to conform to contract or are of unsatisfactory quality or performance standards at the time of delivery. Pets are included under the Lemon Law. Terms and conditions. Consumers are advised to sign up for magazine subscriptions with clearly stated cancellation and refund policies. Consumers should pay special attention to any clause giving businesses the right to renew the contract automatically without proper consent. Be aware of the 3 days cooling-off period. If the products is sold door to door, the consumer has 3 days to cancel the contract. Known as the cooling-off period, it starts the day after the purchase is made, discounting Saturdays, Sundays, and public holidays; or if the cooling-off period was not brought to your attention before or at the time you entered the contract, the day on which it was subsequently brought to your notice. Cancellation of the contract should be done in writing. Consumers can deliver it personally to the vendor, or send it by pre-paid post or fax. Extra charges. Find out if there are additional charges applicable, such as delivery charges. The amount should be clearly stipulated. Read the terms and conditions carefully, special offers promised by the vendor should also be committed in writing. Insist on authorization. Be mindful of the terms and conditions governing "free copies to be sent over a period of time" There is a tendency for business to charge you after the free period is over without your authorisation. Insist that the business obtain proper consent before they continue the subscription. Know the methods of dispute resolutions. Consumers with unresolved disputes can approach CASE for assistance or file their claim at the Small Claims Tribunals. Know your rights. Buyers of resale HDB flats have 14 days to think over the intended purchase, and to check his eligibility, financing aspects and other issues. However, to enjoy this feature, buyers should ensure that they only sign the option portion of the OTP. The option fee will be forfeited (retained by the seller) if the OTP is not exercised. Know the procedures. Buyers and sellers of resale HDB flats must use the 10 page OTP issued by HDB free-of-charge, consisting of a set of an original and two carbon copies. They should also read the "Important Notes" which come with the OTP. HDB’s website (www.hdb.gov.sg) has a step-by-step guide to buying and selling a HDB flat. Know your options. Consumers who need advice and assistance can approach CASE at tel: 6100 0315. Beginning 2011, CASE is also appointed as one of the organisation to handle mediation cases referred to by CEA. Have an on-site visit. Rather than rely on advertisement materials, it will be more prudent for consumers to visit the venue location so as to assess the service standards and the facilities available before committing to a service package with the vendor. Be clear about the Terms and Conditions. Before committing to a service package, consumers should be clear about the terms and conditions applicable. Find out about the refund policy. Consumers should enquire about the applicable refund policy. Relevant terms and conditions should be committed in writing. 10% Service Charge. If the consumer is not happy about the 10% service charge as he/she is not satisfied with the level of service that he/she got, he/she should first negotiate with the restaurant over the said service charge. Think over it. Even if consumers are keen on the package, they should take a few days to consider the offer. Purchases made on impulse might not be financially viable in the long run. Verbal promises committed in writing. If verbal promises of refund are given, get it written down in contract. Know the limitations of current beauty and slimming technology. Seek medical advice first. Consumers are advised to seek medical advice before embarking on slimming programmes. Know the methods of dispute resolutions. Consumers with unresolved disputes can approach CASE for assistance or file their claims with the Small Claims Tribunals. Monitor bills regularly so that consumers can highlight any possible discrepancy immediately. Request for breakdown. Consumers can also request for a breakdown of the billing charges to identify possible causes for the high charges. Get advice from respective Mobile Telecommunication Operators (MTO) on barring of premium sms services, and how best to ensure that inexperienced users like young children do not unwittingly incur hefty mobile phone bills. MTO must assist their customer in disputes involving other telecommunication licensees providing content services (mobile content providers) for which their MTO is a billing agent. Defer payment on the disputed portion of the bill. The MTO should not demand that the consumer pay the disputed charges while the investigation is ongoing. Know the methods of dispute resolutions. Consumers can feedback their problems to iDA at info@ida.gov.sg They can also call the CASE hotline at 6100 0315 for assistance. Know your rights. Under the Consumer Protection (Fair Trading) Act, for timeshare contracts signed after 1 March 2004, consumers are entitled to a 3-day cooling-off period. The 3 days excludes Saturday, Sunday and Public Holidays. However, in light of the new amendments passed, contracts signed after 15 April 2009 will be entitled to a 5-day cooling-off period instead. They should receive a Consumer Information Notice (which explains the procedures for cancellation), and a Notice of Cancellation (the cancellation form itself), of which Part A of it should be completed by the timeshare company. Know the procedures. If consumers wish to terminate the timeshare within the cooling period, they should complete Part B of the Notice of Cancellation, and send it back to the company by post, faxed or hand delivered, preferably by registered post, to ensure proof of postage. Know your options. At the moment, the Small Claims Tribunals does not handle disputes regarding timeshare agreements. The consumer can consider either CASE or legal action. Check that a travel company is licensed. The Singapore Tourism Board (STB) licenses travel companies in Singapore. Their website, (https://trust.yoursingapore.com) lists the active, ceased, suspended, or revoked travel companies in Singapore. Consider accredited travel companies. Consumers may wish to consider companies that are accredited by CaseTrust. While this does not guarantee that they will have zero complaints, choosing an accredited company reduces the chances of problems, and accredited companies should have clear dispute resolution procedures. Put verbal agreements in writing. As it is not easy to enforce verbal agreements, it is prudent to put them in writing. Most travel companies can only confirm group tours two weeks before departure as such tours are subject to group size. So if a company promises that a particular group tour can be confirmed on the spot, get it down in writing. Get tips on travelling. The National Association of Travel Agents Singapore (NATAS) has a website (www.natastravel.com/traveltips.aspx) that provides useful information on what to look out for when considering a travel package. Members of NATAS are also committed to adhere to a standard refund policy. Know the methods of dispute resolutions. Should a consumer have a dispute with a travel agency and is unable to resolve it, the consumer can seek CASE assistance or file a claim at the Small Claim Tribunal.